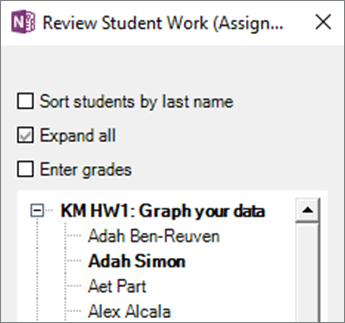 You can check to see if a student has worked on an assignment in Class Notebook Add-in for OneNote 2016 and 2013 without opening each individual assignment. Whenever a page in OneNote is changed, it appears in bold. The changes a student makes on the page appears highlighted, and is labeled with their initials. Open the Class Notebook you want to check in OneNote. Select the Class Notebook tab, then Review Student Work. Choose the student work section you need to review. For example: Handouts. Where changes have been made, the name of the page appears in bold. Expand the assignment to see a list of your students. Every student who’s made changes to the assignment will appear in bold, too, even if you’ve already graded their assignment. Note: Once you open a student’s assignment page to review their work, the student’s name will no longer appear in bold. Why is some text highlighted in a shared notebook?